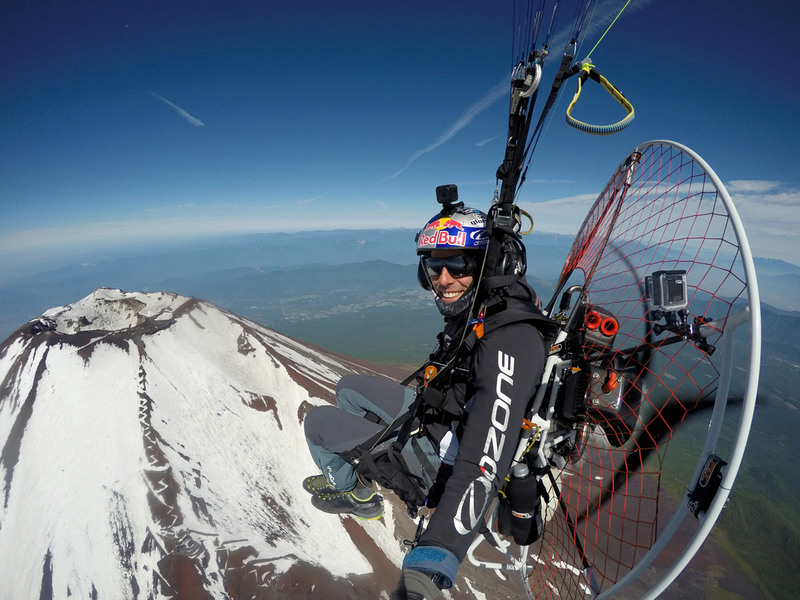 Paramotor overfly of Mount Fuji! Less than 24 hours after arriving to Japan and still fighting serious jet-lag, I managed to overfly Mount Fuji (3,776m) !!! It was simply insane, a dream coming true! 55 km flight with an altitude gain of 4200 meters, launching and landing at the shores of the Pacific Ocean! I had this in mind since ever I knew I'll come to Japan for the RedBull Air Race in Chiba which meant that I'll have all my paramotor gear here for the show. I didn't have much time available to make it happen but the weather forecast looked good for the next morning: sunshine and light winds! A typical scenario could have been strong high-altitude winds, clouds covering the peak or even rain so I had to go for it even though I felt really tired and I only had 1 day to prepare everything after my arrival to Japan. Luckily my friend Yoshiki Kuremoto picked me up on the airport and we went to collect my equipment in Chiba, then after some sight seeing in Tokyo we headed to Fuji city in the evening to scout for a suitable take-off location on the beach and get some rest. My idea was to launch from the sea level, make it to the summit and return! From sea to sky! We got to the take-off spot 5 in the morning but I had to wait a bit for the wind to switch so finally I got airborne at 7:30 am. Soon after take-off I had to quickly realize that terrain ahead of me is not quite as I was expecting it after studying the satellite images. All the fields that looked like good landing spots were flooded rice fields, lot's of power lines, some football fields on the way but all covered by really high fences and then - for the main part of the flight - a deep natural forest till half way up the mountain followed by wild volcanic terrain. Trusting my Cors-Air engine I was only going around 70%-80 of power maintaining 3-400 meter over the ever climbing terrain for the first 12 km. Then hit full power when things started to look more serious at the beginning of the forest and I realized that there are no proper landing options. I arrived to Fuji's slopes at 2500 meters and I was really hoping to get some dynamic lift and early morning thermal lift to help the climb up. Not having much experience with cross country paramotoring I was a bit concerned about my fuel consumption (took-off with a full tank of 12 liters) and with my moderate sized engine (172 cc) it could have taken quiet a while to reach the summit in that thin high-altitude air. But luckily indeed there were some thermal bubbles so I carefully made my way around from the south face to the sunny east face. My track-log looks a lot like a regular paraglider's track as I was always searching for the rising air bubbles all the time. Finally, to reach the edge of the crater and look inside of it for the first time was a really emotional moment! From that point on there was no more natural lift but I kept pushing full power all the way while I was enjoying the scenery and taking pictures from all angles. This kept me climbing with approx. 0.5 m/s up to 4200 meters, till I left the summit after cruising above it for 20 minutes. I'm wondering how much higher I could have gone but I already felt really cold and still had a long way back to the beach. So I set off for the spectacular 25 km glide back to the beach, but this time gliding safe and high over the wild forest while the first thermal clouds were forming far far below. What a moment! Only 2 hours after my landing the peak was already covered with clouds and later it even started to rain making me realize how lucky I was to catch this short but perfect weather window for the mission! To complete the circuit, I needed about 7-8 liters of gas, so finally much less then I expected but for sure also thanks to the natural lift coming off the massive volcanic slopes. An unforgettable experience! - GoPro Hero4's and Session to capture everything from different angles. Many thanks to the weather gods and all the local help, especially from Yoshiki Kuremoto!